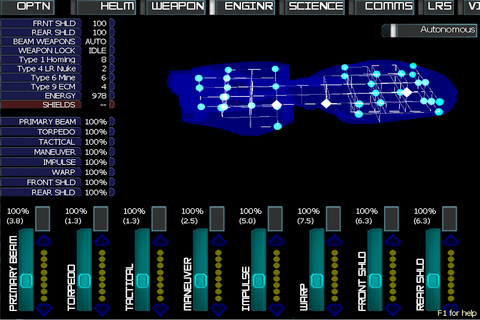 This weekend at ConDor I finally had the chance to try out Artemis, the Spaceship Bridge Simulator. I've wanted a gaming experience like this for decades, only heightened by the disappointing Star Trek: Bridge Commander in 2002 which left so much to be desired. The setup of Artemis is simple: Five people take on the various roles of a starship bridge. 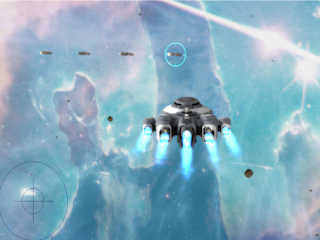 Each player gets their own screen with a unique set of capabilities. One player, though, has no capabilities -- they act as captain, and simply make the decisions for the other players to carry out. 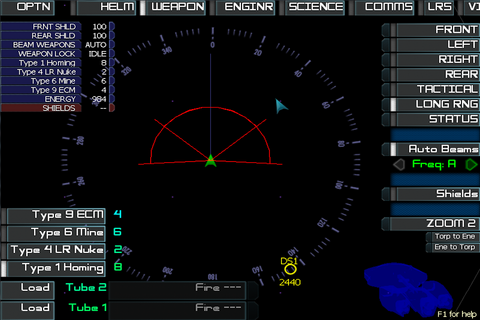 The only information the captain gets is what the players tell him or her, or decide to put up on the main screen. 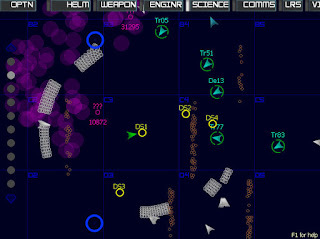 In the game I joined we had a 3-person crew: science officer (me), pilot, and weapons. The empty seats should have been a communications officer and an engineering officer, which are probably the only two roles you can safely skip (though things would go much better with these people present). Our mission was to protect four space stations at all costs. 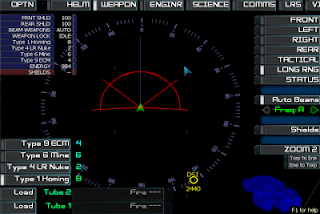 As science officer my radar-like screen focused on a very broad view of the space around us. 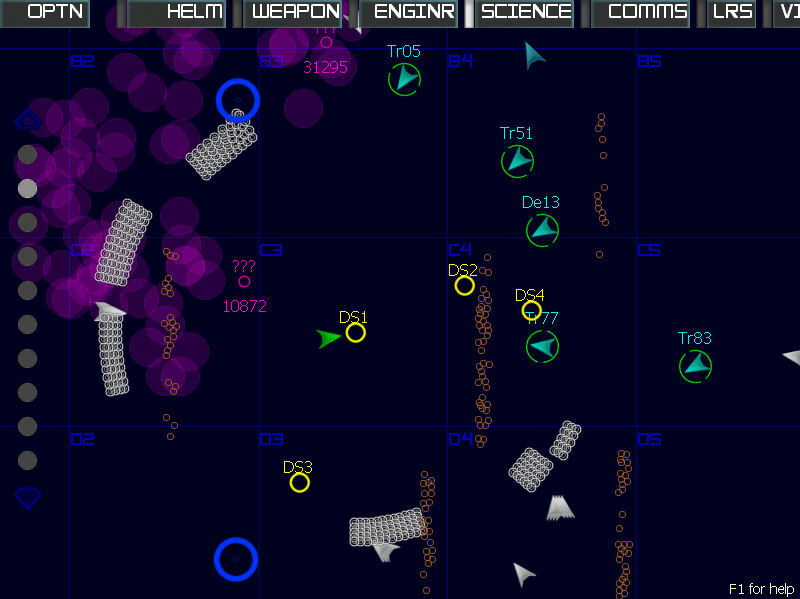 My job was to keep tabs on all the ships, asteroids, space stations, and other crap in our general area. Hostile ships were coming in from various points on the map and driving in toward four space stations which we had to protect. I would scan the enemies and offer advice on which targets we should we worried about, what heading our pilot needed to fly in to intercept, and as we moved in close enough I could acquire more detailed scans. This information I relayed to our weapons officer who could then fine tune his targeting. And by relayed, I mean I had to say, or even shout, the information. That's the great things about Artemis: the party game aspect of it. It was designed from the beginning to be played by people in the same room together. My bridgemates were all very much into the role-playing aspect of it, doing our best during the lulls to call out important ship information or compliment each other on particularly savvy operational feats. When battle happened, which was often, it was exhilarating and just as chaotic as you'd expect. We were all shouting over each other as carefully laid plans went haywire for the dumbest reasons: we forgot to put the shields up, we overshot the enemy, we ran out of ammo before the battle was done, and so on. The more we played, the more we started working together. I can't help but think Artemis would make a great team-building experience for people who work together. In Artemis you live and die by two things: strong decision making and clear communication. To that end I think it's somewhat brave and brilliant that the designers put no person-to-person communication into the game itself, forcing you to actually talk out loud to relay information. You cannot, for example, send a private text to the weapons officer letting him know what frequency to set the beam weapons to. Though that information is only relevant to weapons, deciding when, if, and how loudly to relay the info is all part of the game. You may blurt it out just as the captain is issuing the order to get the hell out of there, for example. Which brings me to another realization. I could argue that this game is really a simulation of a made-for-TV spaceship bridge (and it's pretty obvious which TV show they modelled it after). Although we were having a ton of fun playing, the game made it abundantly obvious that this sort of bridge setup would be woefully disastrous if used in the real world. The decisions for what information each player can and cannot see are extremely arbitrary and done purely to encourage the type of teamwork I mentioned earlier. And that's okay! But by the same token, it really started the gears turning in my head about what a more realistic setup might be. Fodder for future stories, to be sure. All in all, Artemis is a ton of fun. The trick of course, much like any board game or good pen-n-paper RPG, is finding the right players and then actually getting together to enjoy it. I'll definitely be looking into local player groups I could join, and keeping my eyes open for Artemis games at any convention I attend. I'll leave you with this video of Wil Wheaton, John Scalzi and others playing Artemis in front of a live audience.